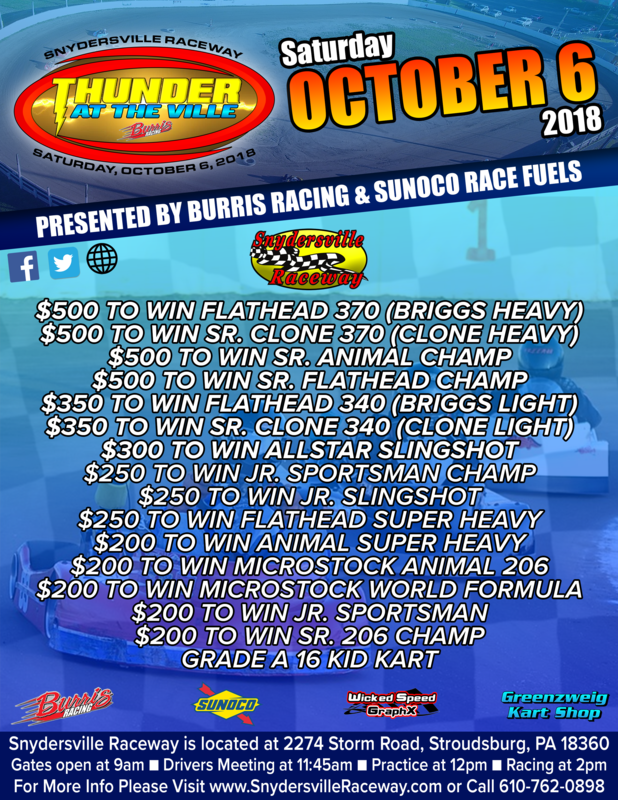 2018 Thunder at The Ville set for Saturday, October 6 with Big Cash on the Line! Come one, Come All to Snydersville Raceway for The 6th Annual Thunder at The Ville. It is our biggest event of the year with 16 BIG MONEY CLASSES WITH THOUSANDS OF DOLLARS IN WINNINGS, PAYOUT, CONTIGENCIES AND PRIZES!!! 16 DIVISIONS WILL BE DUKING OUT IN THE POCONOS FOR BIG CASH AND GLORY! This year the 6th Annual Thunder at The Ville will be BIGGER & BETTER! Last 150 Karts Packed the Pits as they duked it out for the Cash! Come on out and Join Us for Thunder at The Ville and try your skills on the 1/8 mile dirt oval! Plus Gift Bags & Prizes for Kids! ALL METHANOL CLASSES WILL HAVE A RANDOM DRAW FOR A FREE GALLON OF SUNOCO METHANOL!!!! • Clone Heavy- 2018 AKRA Clone Rules, Open Clutch, Big Pipe, 370 LBS Minimum Weight, Ages 15 & Up, FUEL RULE- 87 Octane from Schoch’s Sunoco off Route 33 at the Snydersville Exit. • Clone Light- 2018 AKRA Clone Rules, Open Clutch, Big Pipe, 340 LBS Minimum Weight, Ages 15 & Up, FUEL RULE- 87 Octane from Schoch’s Sunoco off Route 33 at the Snydersville Exit. ELECTRONIC SCORING: Snydersville Raceway uses a Mylaps/AMB -i-t Scoring System. Please Make Sure You Bring your New Style Mylaps/AMB Clip or Westhold Bag. Rental Transponders will be available to all drivers. If you have your Transponder please make sure you provide the long number on the front of the transponder at Sign-in. Mounting Requirements can be found in our Rule-book. Friday Night: There will be no Practice or Racing on Friday, October 5, 2018. PIT PARKING- Drivers who have Reserved Pit Spots for 2018 must inform the Track if Attending or Not by Friday, September 28, 2018. There will be no Fee for those that bought a yearly reserve spot. For Spots that are currently UNRESERVED can be Reserved in Advanced for the Event. It will be $20 per spot. THERE WILL BE FREE SPOTS AVAILABLE. IF SPOTS ARE UNRESERVED ON DAY OF EVENT, SPOTS WILL BECOME FIRST COME/FIRST SERVE. TRUCK & TRAILER SIZE IS REQUIRED TO FIT EVERYONE CORRECTLY. Contact Alex at 610-762-0898 to Reserve Spots. Full List of Hotels can be found on our website under the Info tab on the Directions and Hotel page!